Law professor Rhonda Magee explains how mindfulness can benefit lawyers, their clients—and, perhaps, society at large. Let’s face it: seeing the words “lawyer” and “mindfulness” in the same sentence looks a little weird. Law professor Rhonda Magee is teaching the next generation of lawyers how to forge positive relationships and manage conflict using mindfulness. This might be why lawyers suffer disproportionately high levels of depression, substance abuse, and suicide. Lawyers are almost four times more likely to be depressed than non-lawyers, and twice as likely to be alcoholics. According to the Centers for Disease Control and Prevention, lawyers rank fourth in the professions with the most suicides. So maybe there is a role for mindfulness in the legal profession after all. According to Dr. Andy Benjamin of the University of Washington, the trouble starts in law school, where students encounter high workloads, stress, intense competition with their peers, and an emphasis on analysis and linear thinking that causes “loss of connection with feelings, personal morals, values, and sense of self.” In one study Benjamin conducted, 40 percent of law students were suffering from depression by the time they graduated. This is why I find the work of University of San Francisco School of Law Professor Rhonda Magee to be so inspiring and necessary. 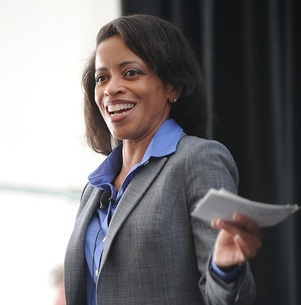 She is teaching the next generation of lawyers how to stay connected with who they are, how to forge relationships built on compassion and mutual respect, and how to skillfully and healthfully manage ever-present conflict situations—all before the students even graduate from law school. I talked with her over email about putting these ideas to work. Sara Tollefson: How did you first connect mindfulness and the law? Rhonda Magee: I was first inspired to connect mindfulness and the law about 20 years ago, when I was just starting out as a lawyer. I had some experience with contemplative practices from a variety of backgrounds, and it became obvious to me that relying on these practices seemed to make me more capable of handling the demands of my work as a litigator in a large law firm. Later, when I began teaching law, I realized that the practices and outlook that emerge from mindfulness might offer benefits not only to my students, but to those tasked with interpreting, applying and making law. So I started to look for others who were exploring the same ideas, and I began to work with lawyers and law professors (and even a judge or two) who had come to see the value of these practices as well. The coursework I’ve developed and the research and writing that I’ve done in the area have flowed from that. Having begun the work, the responses of my students, lawyers in practice, and others with whom I’ve worked keep me inspired to develop and deepen this work further. ST: And how do you define mindfulness? RM: In my work, I use the term “mindfulness” in two main ways. The first refers to a set of practices that focus one’s attention on the present moment with the intention of enhancing presence, and with attitudes that support kind-hearted openness to whatever arises. The second refers to the state of awareness, or more broadly, a way of being in the world that arises for many people and becomes more readily available over time as a result of engaging in such practices. ST: How does mindful lawyering benefit clients? How does it benefit lawyers? RM: Lawyers who practice mindfulness experience the same benefits that other practitioners report: everything from increased emotional self-awareness and self-regulation, to improved capacity to handle stress and increased concentration and psychological flexibility. Mindfulness practices increase lawyers’ capacity to be present and high-functioning, no matter how unpredictable or potentially distressing the situations in which they might find themselves. They are also better at assessing high-conflict or other challenging situations from multiple perspectives. Such outcomes make lawyers more skillful at handling stressful situations at work and in their personal lives, leading to increased well-being overall. In predictable ways, clients are also better served when their lawyers have a deeper set of resources for handling stress and dealing with conflict and uncertainty. Clients benefit from their lawyer’s greater sense of compassion and greater ability to communicate in ways that maintain a sense of concern and respect. ST: What about society at large? Do you think we’d see a social change as a result of mindful lawyering? RM: The benefits to society at large may be harder to measure but are every bit as real. Mindful lawyers are finding more creative ways to assist clients and to envision their law practice, often taking on the roles of peacemaker and/or healer in their communities. Mindful lawyers who serve as leaders, judges, or other lawmakers are interpreting and shaping law and public policy through the more expansive lenses shaped by their enhanced capacities for perspective-taking. In doing so, they are creating law and policy that looks and feels more like justice in the world. ST: What gives you hope that we might see more mindfulness in the law? RM: The fact that students are more and more exposed to mindfulness upon entry into law schools, and that the culture generally is becoming more accepting of these practices makes me quite hopeful that we will see more mindfulness in the law over time. More and more, law professors are interested in exploring these practices, and are working together to support one another in developing approaches to incorporating these practices into our methods for teaching and learning. I’m presently working with Charlie Halpern of Boalt Hall School of Law at UC Berkeley and several others to develop a National Collaborative for Mindfulness and Law. We’ll join with folks like Richard Reuben, who has engaged in an effort to study the effects of mindfulness on his students at the University of Missouri, and Scott Rogers, who has been examining how these practices affect law students at Miami University, to share what we’re learning and develop model curriculum. I’m also researching and writing about a systematic approach to incorporating these practices into legal education. At the same time, with the increasing support of leaders in local and regional legal communities, lawyers across the country, from Seattle to Minneapolis, from Phoenix to New York, are offering programs that support mindfulness as a component of ongoing professional development. As more law schools, practicing lawyers, and leaders within the various state bars get involved, there will be more programs for continuing legal education and continuing judicial education for lawyers and judges, and the movement along all fronts will continue to flourish. Select a set time for a five- to ten-minute “Mindfulness Reset” each day. It might be the first thing you do when you sit down at your desk as you transition from your commute. It might be the way you settle in back in after your lunch break. For those five minutes, allow your mind to settle on the sensations of breathing in and out, and to let whatever other thoughts, sensations or emotions arise, and without attaching to them, allowing them to float by as you would a row of clouds across a bright blue sky. You can always investigate or follow-up on what arises later, but for the period of your Mindfulness Reset, just let these objects of awareness simply arise and float away. Another suggestion is to incorporate a mindful gratitude practice into your daily routine, by ending each evening by reflecting on three things that you experienced that day for which you are grateful. Call each pleasant event or experience to mind and allow the associated thoughts, sensations, and emotions to expand into your awareness and fill you with the sensations of mindful gratitude for a minute (not long enough to start going into story! ), before going on to the next thing. Finally, it’s extremely helpful to experience the support of at least one other person who shares your interest in bringing mindfulness to work. You might be surprised to find a co-worker who is willing to support creating space for or sharing ideas for bringing mindfulness into your workspace, or even sitting quietly together for a few minutes a few times a week. If not available in your office or workplace, seek out social support using technology. Believe it or not, you may find that having a friend with whom to sit quietly on the phone or on Skype—perhaps as a prelude to a mindful exchange of reflections on what’s up for each of you (without trying to fix one another in those moments! 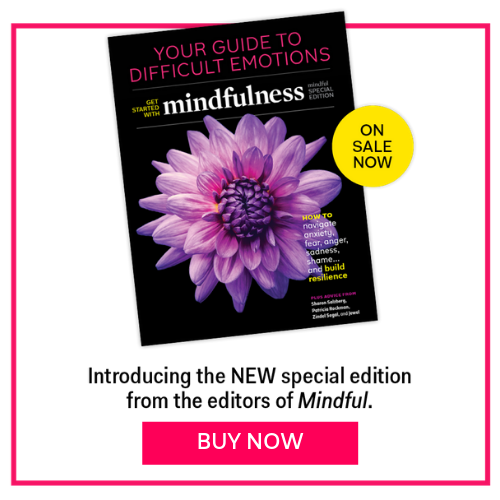 )—is just the extra support you need to keep your mindfulness habit alive and thriving. To be successful in bringing more mindfulness into your work, I’d also suggest that you continually strengthen your intention and commitment to do so. Remind yourself why you believe this is important, and make a genuine commitment to cultivate your practice. You might find a single reminder of your intention to create space for mindfulness, something that might be discreetly brought into the office, such as a rock engraved with the word “Gratitude” or “Breathe,” a book about mindfulness that you might place on a shelf at eye-level, anything that works for you. Select a place for your reminder in your workspace, and allow it to serve as a visible and tangible reminder of your commitment to yourself to be mindful as you work. And of course, this is just scratching the surface! Those who are interested in finding out more should consider reading and studying about the mindfulness traditions that have given rise to our contemporary appreciation of these practices. There is much depth there. My suggestions are merely a door into a profound set of teachings and learning. Sara Tollefson, J.D. is a lawyer and past member of the Fetzer Institute’s Law Professions Advisory Council.